The best first aid kits for camping are big enough to cover multiple people for multiple days. 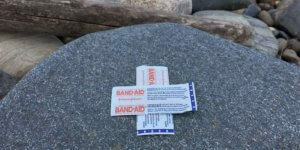 The two bandages in your wallet don’t count as a first aid kit for camping — better to be prepared with a real kit. 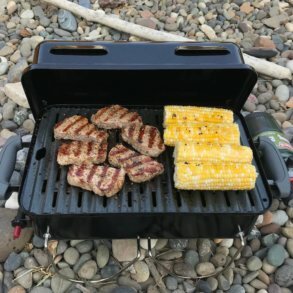 The best first aid kits for camping in 2017 and beyond are those that have a lot of core first aid supplies and plenty of room for personal add-ons. 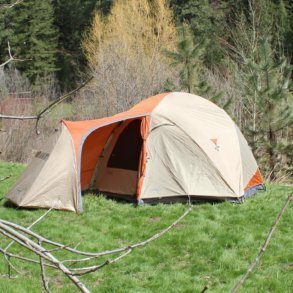 The thing about camping is that you’re usually camping with a wide variety of friends and family members, plus you’re often in closer proximity to other campers who might need your assistance. It’s good to be the kind of camper who can help out in an emergency — even minor ones that are just kids with boo boos. There are a handful of companies that produce first kits that we trust and recommend — and a lot more we don’t trust. There are many cheaper assembled first aid kits out there, and we try to avoid them. First, kids don’t do well with cheap bandages that won’t stay on, and second, we don’t like cheaply packaged medications or scissors that won’t cut. If you’re in an emergency, you want these things to do their jobs. The kits below have been put together by outdoor enthusiasts for outdoor enthusiasts, plus they each come with their own wilderness first aid guides. The leader in outdoor-oriented first aid kits is Adventure Medical Kits, and as you’ll see, they’ve teamed up with Cabela’s and Bass Pro Shops to help those companies offer their own branded versions. Still, even the best first aid kits for camping aren’t quite ready on their own — you should plan on adding a few extra frequently used items. 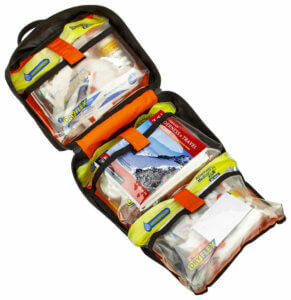 The Adventure Medical Kits Mountain Explorer Kit includes the handy “Wilderness & Travel Medicine” guide. It hits a sweet spot for quality and overall value. The Benadryl is to help with allergic reactions to bug bites and bee stings. On multiple occasions I’ve seen kids and adults get stung in the head, neck, and mouth, which caused worrisome swelling around the throat. In an emergency situation, an antihistamine like Benadryl might be the difference between life or death. Also, because some people have severe reactions later in life — when they did not as kids — even someone who doesn’t think they’re allergic might have a problem in the future. The L.L.Bean First Aid Kit is small enough to toss into a daypack for hikes around camp. 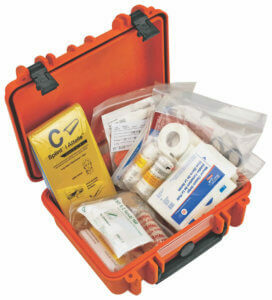 Adventure Medical Kits Family First Aid Kit — The centerpiece of this 1 lb. 1 oz. kit is a first aid guide to caring for children in the outdoors, covering how to treat sprains, fractures, dislocations, and how to treat more serious wounds. It includes an instant cold pack and a larger-than-usual stock of common bandages. It also has a handy kit-within-a-kit bag that can be pulled out and stashed in a day pack or stroller. Bass Pro Shops Family First Aid Kit — The Bass Pro Shops branded Family First Aid Kit is very similar to the Adventure Medical Kits version. Both are designed to treat common injuries for four people for up to six days. 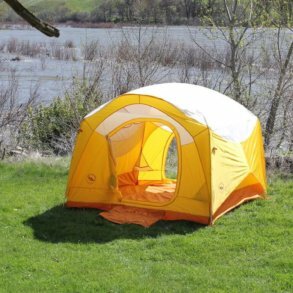 It includes a kit-within-a-kit pack that you can load up to take on short hikes without taking the entire first aid kit. The best feature, though, is the Adventure Medical Kits guide book, “Caring for Children in the Outdoors” that covers first aid for children. Cabela’s Essentials First Aid Kit by Adventure Medical — The Cabela’s Essentials First Aid Kit includes bandages, medications, scissors and standard first aid items as well as some handy survival items like fire starters, fire cubes, and a rescue whistle. It all comes packed in waterproof pouches that fit inside a water-resistant zip bag. It includes a first aid pamphlet. It’s an excellent overall value. The Cabela’s Essentials First Aid Kit comes includes core first aid items as well as some survival gear. Adventure Medical Kits Mountain Explorer Kit — The Adventure Medical Kits Mountain Explorer Kit is aimed at up to four people for trips up to seven days. This new kit bag has a particularly handy design so that it unzips into sections that contain items for wound care, cuts & scrapes, medication, and instruments and instructions. It comes with Adventure Medical Kits “Wilderness & Travel Medicine” guide. It hits a sweet spot for quality and overall value. 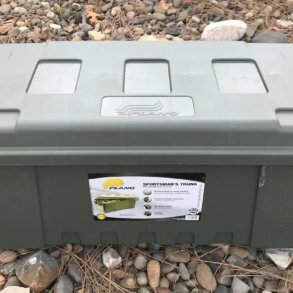 Bass Pro Shops Expedition First Aid Kit — The Bass Pro Shops Expedition First Aid Kit isn’t what we could call a true “expedition” class first aid kit, but it’s a surprisingly good camping first aid kit — especially for the great price. 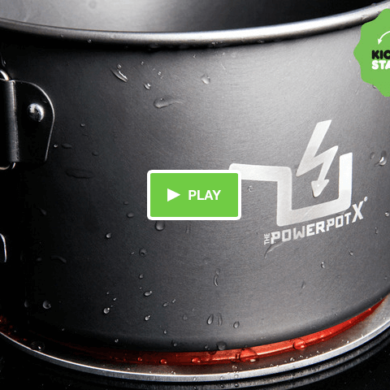 It’s aimed at handling common injuries for up to 10 people for up to six days. You’re going to want to add in a few extra items yourself, and the bright red pack has enough extra space to allow it. We especially appreciate the included Adventure Medical Kits “Wilderness & Travel Medicine” first aid guide. REI Co-op Backpacker Extended First-Aid Kit — REI no longer makes a specific camping first aid kit (we’re bummed about that) but REI still produces excellent lightweight first aid kits for hiking and backpacking. The Backpacker Extended version is packed with essential first aid gear and has an excellent bag design that makes all the items easy to see and get to — handy when you’re in an emergency situation. 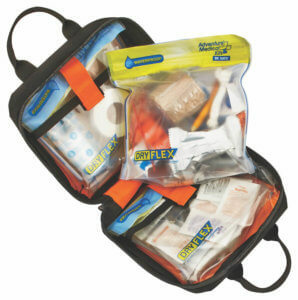 It includes a smaller removable kit for day hikes, as well as a first aid manual. The best feature, though, is it’s weight — just 1 lb. 5 oz. Highly versatile — and highly recommended. The Cabela’s Outfitter First Aid Kit includes a C-splint and comes in a strong waterproof case. 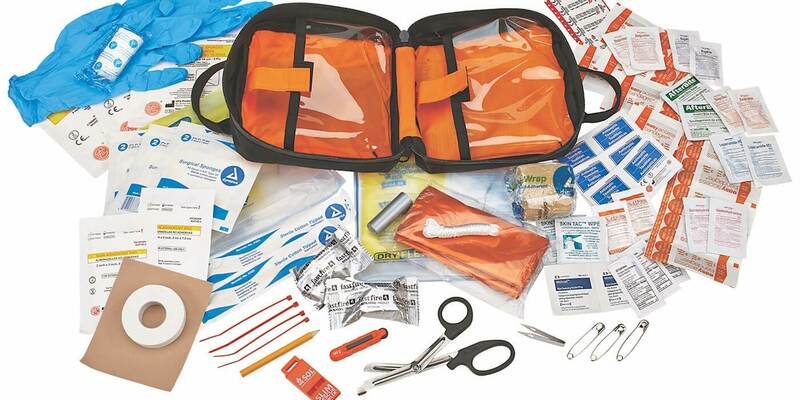 Adventure Medical Kits Mountain Guide Kit — This first aid kit is the sectioned bag design. It has separate zip sections with handy labels, including medication, cuts & scrapes, wound care, fracture, sprain, and stop bleeding fast. It includes a C-splint, wound irrigator, thermometer, clotting guaze, and all the basics, including the Adventure Medical Kits “Wilderness & Travel Medicine” first aid guide. Cabela’s Guide First Aid Kit by Adventure Medical — This camping first aid kit is great for those who like to get off the beaten path — like professional guides, of course, but don’t let the “guide” moniker scare you off. The first aid gear contains all that you would expect, including a variety of bandages, elastic bandages, wound gauze, standard medications, EMT sheers, a wound irrigator, and gloves. Better yet, it adds a few survival tools, too, like a signal mirror, fire starter, cord, and a headlamp. Highly recommended. Cabela’s Outfitter First Aid Kit by Adventure Medical — This sweet first aid kit comes in a bright orange, waterproof, hard-plastic box, perfect for stowing in a vehicle. It includes a variety of bandages, ointments, painkillers, tape, gloves, clotting gauze, EMT sheers, tweezers, a wound irrigator, and a C-splint. Also includes a field guide to wilderness first aid. The Cabela’s Guide First Aid Kit is one of the most versatile first aid kits for camping. If you’re having trouble choosing the right first aid kit for you, error on the side of bigger is better — at least, error toward more fully stocked first aid kits. That said, the REI Co-op Backpacker Extended First-Aid Kit gets our nod for being the most overall cost-effective option because it is so lightweight and versatile. Similarly, we’re fans of the Cabela’s Guide First Aid Kit because it covers the first aid basics plus adds in a small headlamp and survival gear.